The Lean community continues to face a problem that hurts efforts to advance progressive Lean management. It is the great difficulty in clearly separating and effectively communicating the difference between Real Lean and Fake Lean – Lean management done right from Lean management done wrong. On the surface, this distinction is rather simple. Real Lean is the application of both principles, “Continuous Improvement” and “Respect for People,” while Fake Lean is the application of only the “Continuous Improvement” principle. While the words are simple, their meaning is much broader and deeper than normally realized. As with all things Lean, it is the details that matter. 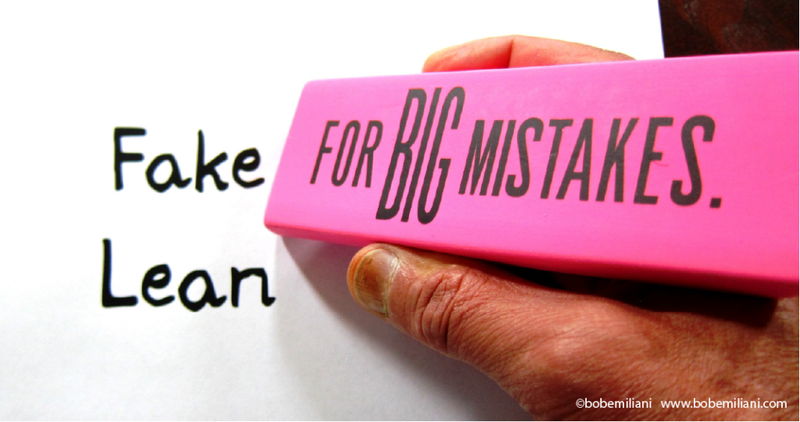 There is so much Fake Lean out there, and so little Real Lean, that one can ask, “How do we fix the big mistake that so many leaders have made?” Or, should we just accept what has happened and move on? I don’t think we can accept what has happened and move on. Fake Lean harms people, and so we must do something about that. It is irresponsible to remain idle. The Lean approach to solving this problem asks that we examine the process used to educate leaders on Lean management. But, there is no centralized source to assure the process used to teach leaders about Lean management achieves the target condition: Real Lean. Instead, there are multiple sources: non-profit training and education organizations, post-secondary educators, consultants, freelance trainers, corporate trainers, people who write books, people who write articles for newspapers and magazines, and so on. There is wide variation, and nearly all of these sources have a far better understanding of Fake Lean than they do of Real Lean. People thought the process of teaching Lean tools (e.g. 5S, standardized work, value stream maps, A3s, etc.) would create Lean enterprises. But, instead we got a proliferation of Fake Lean enterprises with little or no material and information flow. Learning Lean management this way resulted in isolated improvements, weak and low impact problem-solving, resume-building, business decoration, and layoffs to secure short-term savings. This widely used approach to educating people about Lean management appears to be almost entirely wrong. Instead of teaching Lean management tools (and all of its sub-specializations, Lean healthcare, Lean IT, Lean product development, Lean sales, etc. ), we should teach flow and define “world class” simply as: “Transforming all processes from batch-and-queue to flow.” Those who pursue that challenge would, without doubt, discover the two Lean principles, methods, tools, and leadership routines that are required to achieve flow, just as Toyota (and others before them) did. Flow is the foundation of Lean management. We must face the fact that when we teach Lean management, especially to executives, they cherry-pick the principles, methods, and tools that they think are necessary and continue to behave in the zero-sum (win-lose) ways as they always have (i.e. disrespect for people). But, to be “world class,” to create flow, means that people have no other choice than to correctly learn Lean management (learn Real Lean by doing). Flow drives everyone to the same two principles and set of interconnected practices. Flow focuses problem-solving, to achieve the desired outcomes: higher quality, shorter lead-times, and lower costs. People will be forced to develop the “basic way of thinking” that supports flow (and let go of traditional ways of thinking). You will not cherry-pick things. And you will not do harm, as is always done with Fake Lean. To achieve that you will use the two principles, methods, and tools correctly. You will use the scientific method and related structured problem-solving routines. Deep learning is the result. In contrast, learning as the objective does not result in flow. Flow is the foundation of Lean. The departure from flow as the objective to some other thing (such as randomly applying Lean tools, learning, problem-solving, productivity improvement, growth, maximize shareholder value, or other) has had the unintended effect of generating widespread Fake Lean and perpetuating batch-and-queue processing, which, in turn has harmed people (especially employees) and tarnished the Lean movement.